The last quarter has proved to be nicely balanced at Kobas, with good progress on many fronts. We’ve made exciting improvements to both EPoS and Kobas Cloud, alongside a sturdy 7% net growth in Kobas EPoS venues and 9% net growth in Cloud venues in the first quarter of 2018. All is not well on the high street. We’ve heard this quarter that Prezzo is closing a third of its outlets, and Byron is closing up to 20 sites. Propel often brings other sad news from smaller operators. We’ve seen some Kobas venues close as the rising costs of rent, labour and produce really put pressure on the market. Kobas also saw some venue losses due to licence revocation, and the desperately sad closure of The Blackbirds Inn due to fire. It is worth emphasising that our 7% growth this quarter is a net position that takes these closures into account; we have to expand into new venues in lieu of any closures before we show growth here. Yet like the legend of the Phoenix, we see that these closures present opportunity – when larger operators yield so many stores in prime locations, landlords lose rent, and customers lose options. Bold and forward-thinking operators can step into this gap. With Kobas as a partner, these entrepreneurs have all they need to manage their team, control their operation and delight their customers. We’re excited to see new ventures approaching us, and we’re buoyed by the continuing growth of long-standing Kobas clients who are going from strength to strength. So despite the bad news in the press, a strong 2018 Q2 is anticipated for Kobas. This quarter we completed our revamp of the Rota creator, and launched Cloud storage and export for Allergens. These aspects of Kobas will still be subject to the usual incremental improvements, yet our priority has moved on. Ahead of the forthcoming GDPR legislation, we’ve improved the Cloud landing page to let users view and maintain their personal data. We’ve also introduced systems that automatically erase outdated information, and manual tools to erase users. 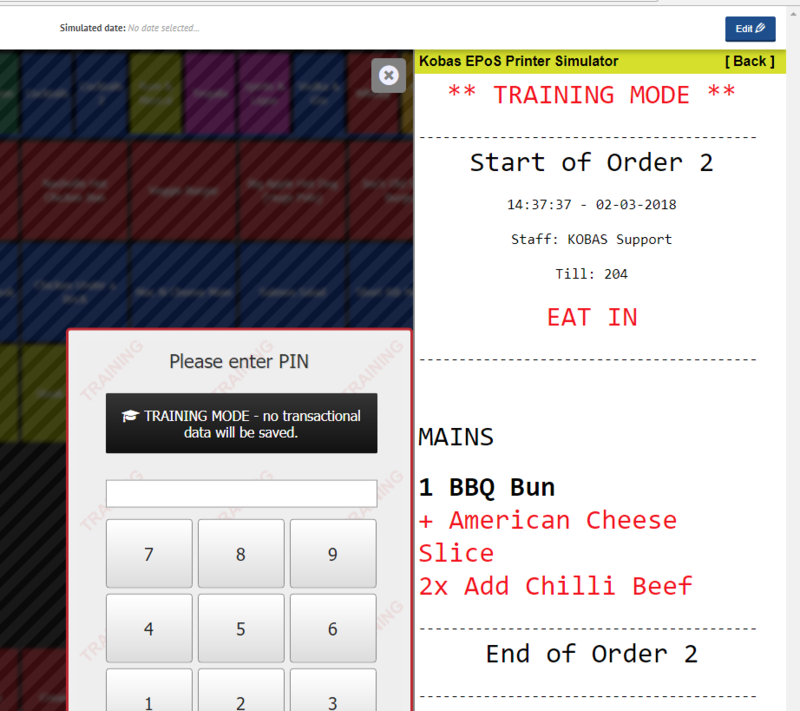 Another key product launch last quarter was the Kobas EPoS simulator – an industry-first technology which permits any Kobas Cloud user to simulate their EPoS units in a web browser, from anywhere and any PC or laptop. It allows clients to test detailed EPoS operations such as item modifiers, new button layouts and complex discount combinations. The stand-out benefits are the ability to simulate being in any venue at any time, and the built-in printer simulator. As discounts can overlap and be time specific, and printing rules can vary by time of day or day of week, this allows for complex operations to be thoroughly tested ahead of time. Looking ahead to the forthcoming quarter, we will be mainly focused on our stock system, with a side helping of customer loyalty improvements. Currently Kobas expects each stock ingredient to have a single supplier and pack size. This has worked well where, for example, a beer is supplied to all venues by the same brewery in the same keg sizes. However, for larger groups which use local produce from different breweries or farms depending on venue location, or where a venue handles different sizes of cola syrup pack, the current stock tracking implementation becomes complex, so this summer’s improvements will support multiple ingredient streams into theoretical stock usage. Associated with this is an improvement to have our theoretical stock system assume ingredients are used up on a first in, first out basis. We’re also working on a new Campaign Manager which will incorporate a Loyalty Points Booster system. This will allows our clients to leverage their customer loyalty schemes in order to incentivise trade at quiet times and promote the sales of certain product lines that need shifting or are especially profitable. While the Campaign Manager is yet to be created, the loyalty points booster engine is complete and in beta, allowing our engineers to set up booster campaigns upon request. If you’d like to run a trial campaign ahead of the official launch, get in touch with our Support team and we’ll see what we can do! This year we are moving our core technologies from PHP 7.1 and MariaDB 10.1 to PHP 7.2 and MariaDB 10.2. Keeping up with the times brings performance improvements, increases product robustness, and generally helps to future-proof the Kobas offering. All EPoS and much of Cloud has already been migrated to MariaDB 10.2, and we expect this process to be complete later in April. After that we will turn our attention to PHP 7.2. 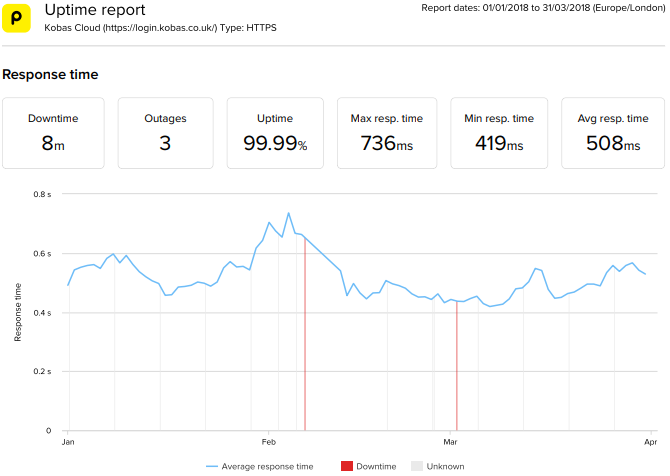 Kobas Cloud achieved 99.994% uptime in 2018 Q1 as measured by our third party monitoring service Pingdom. A five minute outage on the 6th February was the unfortunate and ironic result of a software update intended to improve our error monitoring. It only affected the login screen, so users already using Cloud were unaffected, but it did of course trigger the Pingdom alarm. There were a couple of other very brief outages on the 1st March which appeared to be caused by an anomaly with the AWS internal DNS system. The Kobas web servers rely on that internal DNS system to locate the Kobas database instances; doing so is essential in favour of hard setting local IP addresses so as to take advantage of automatic fail-over systems. Alas for these brief periods we could not resolve the local IP addresses of our databases, hence the brief outages. That’s all from me for this quarterly update. Until next time, keep an eye on our blog and Twitter account for news and updates!